It was about 9 in the morning on April 4, 1968. 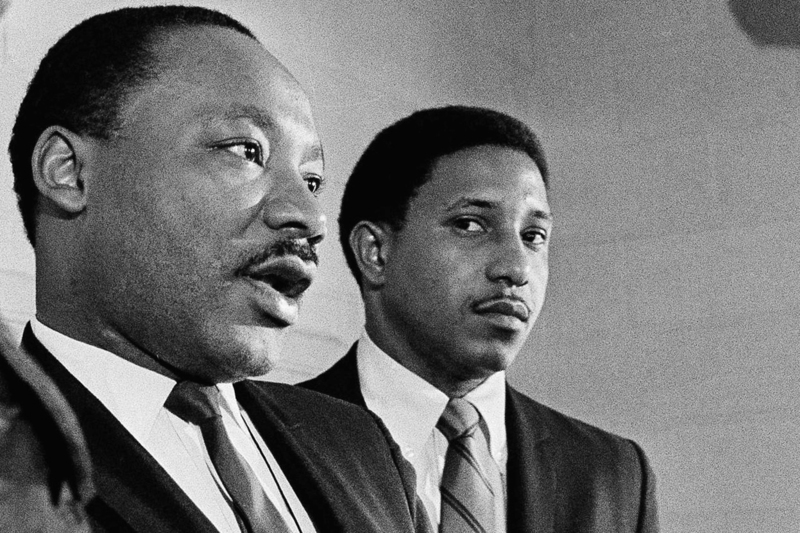 Bernard Lafayette Jr. had gotten the final details of his mission from Martin Luther King Jr.
Later on that fateful day in Memphis, Tennessee, Lafayette would pack his luggage at the Lorraine Motel and head to the airport for a flight to Washington, D.C., the site of his assignment. Eight years earlier, Lafayette had been a classmate of civil rights pioneer John Lewis at the American Baptist Theological Seminary, a predominantly black institution in Nashville, Tennessee. In 1968, he was the national program administrator for the Southern Christian Leadership Conference (SCLC), the guiding light of the civil rights movement in the 1960s. The charismatic and magnetic King was not only the president of the SCLC but also its spiritual force and moral conscience. King and Lafayette met alone in Room 306 that morning to discuss media relations for the Poor People’s Campaign, a monumental undertaking designed to bring national attention to U.S. poverty as the SCLC pivoted toward economic rights. That’s why King and the SCLC were in Memphis in the first place: to help the city’s sanitation workers, mostly black men, address their concerns regarding low pay and dangerous working conditions. Lafayette, the national coordinator for the Poor People’s Campaign, was to conduct a news conference on April 5 at campaign headquarters in Washington. And the media-savvy King wanted the message to be clear. In this Jan. 16, 1968, file photo, Martin Luther King (left), accompanied by Rev. Bernard Lafayette, talks about a planned march on Washington, D.C., during a news conference in Atlanta. By sunset, those words proved eerily ironic. When Lafayette arrived in Washington, Walter Fauntroy, the D.C. city councilman and Washington point person for the SCLC, wasn’t there to pick him up at the airport. That’s when Lafayette had an inkling that something was awry. He called the headquarters of the Poor People’s Campaign, at 14th and U streets in Northwest Washington. That’s when Lafayette found out King had been shot on the motel balcony in Memphis. Later, Lafayette called The Associated Press and United Press International wire services. Two pay telephones at once — with the AP in his left ear and the UPI in his right. “Then, the UPI reporter started crying on the phone,” Lafayette said. That’s when he first learned King had died. Moments later, Lafayette hopped in a cab to 14th and U. There, he called the Lorraine Motel. Andrew Young, the executive vice president of the SCLC, told Lafayette not to return to Memphis. Fly to the SCLC headquarters in Atlanta instead, he said. Lafayette then canceled the D.C. news conference scheduled for the next day. In 1968, Lafayette, at 28 years old, was a veteran of the civil rights movement. In 1960, he had participated in the sit-ins to desegregate lunch counters in Nashville, along with Lewis, Diane Nash and James Bevel. In 1961, Lafayette was one of the original Freedom Riders, along with Lewis, Jim Zwerg and William Barbee, as they tried to desegregate public interstate travel in the South amid physical attacks from angry white mobs. Lafayette also was one of The Children, a book written by Pulitzer Prize-winning author David Halberstam 20 years ago that focused on eight college students, all of whom attended historically black colleges or universities (HBCUs), in Nashville who vaulted to the forefront of the civil rights movement. Lafayette’s alma mater of barely 100 students, the American Baptist Theological Seminary, is now called American Baptist College and was granted an HBCU designation in 2013. In 2018, Lafayette, now a 78-year-old minister, makes the 22-mile drive from his home in Tuskegee, Alabama, to Auburn University on Monday afternoons to teach the principles of global leadership for nonviolence, employing the teachings of King and Gandhi. Lafayette’s Alternatives to Violence Project, started in 1975, engages prison populations in conflict reconciliation and is used in 60 nations. In the 1960s, Lafayette even wrote songs and sang with the Freedom Singers and Nashville Quartet. They sang freedom songs at such venues as New York’s Carnegie Hall, including the “Dog Song,” which was about the irony of dogs from black and white families playing together in rural Southern areas while the children of those same families couldn’t mingle because of segregation. That history has been preserved in more than one Smithsonian museum. Another singer exhibited his reverence for King and the movement. King’s funeral was scheduled for April 9, 1968; the Academy Awards were set for April 8. Entertainer Sammy Davis Jr. and other stars threatened to boycott if the ceremony wasn’t rescheduled, according to the book Inside Oscar. Yes, Hollywood stopped for King; the Academy Awards were rescheduled for April 10. Some SCLC members bandied about the idea of treating King’s funeral like the royals of Buckingham Palace in England, as in the splendor of men wearing top hats and coats with tails. “Some of them wanted to treat him like royalty,” Lafayette recalled. But they ultimately thought better of it, instead opting for the images of King’s legacy. 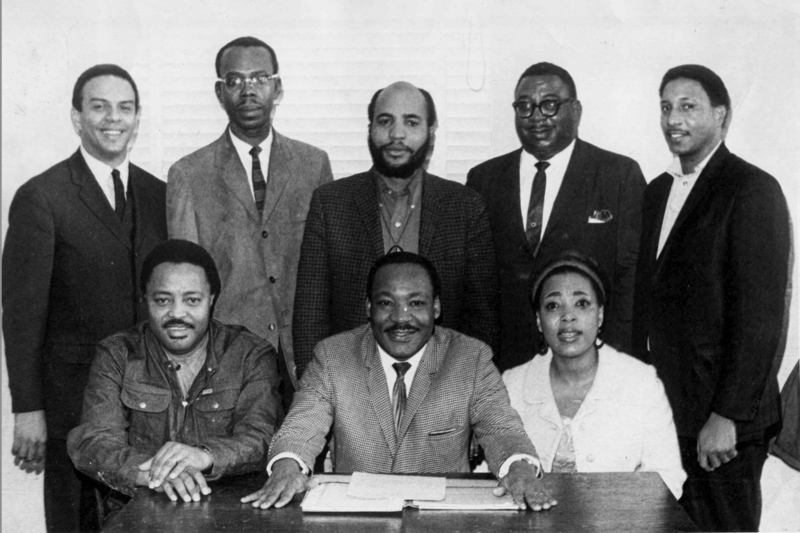 Martin Luther King Jr. (seated, center), Andrew Young (far left, back row) and Bernard Lafayette Jr. (far right, back row) with a group of people in 1967. Courtesy of Bernard Lafayette Jr.
Keep it simple, the SCLC decided. Hence regular men’s attire. And a mule-drawn, wooden farmer’s wagon to carry King’s casket, symbolic signs of poverty. The “Drum Major” sermon served as King’s eulogy, per widow Coretta Scott King’s request. The next two months were both utterly miserable and marginally productive for the SCLC. King’s successor, the solid but less magnetic Rev. Ralph David Abernathy, was determined to launch the Poor People’s Campaign, undoubtedly one of King’s most ambitious projects, which originally was scheduled for April 22. King’s master plan: put issues such as jobs, unemployment insurance, a reasonable minimum wage and education for the poor on the national front burner. The day after Coretta King led a women’s march on Mother’s Day on May 12, a collection of plywood tents and shacks were constructed on Washington’s National Mall. It was called Resurrection City, with a population of about 3,000. Rev. Jesse Jackson was named its mayor. Lafayette spoke of a bizarre backstory to the campaign: For many of the nation’s poor, especially in the rural South, their only mode of travel was by mule. Therefore, some of the campaign participants wound their way to the nation’s capital by mule-drawn wagons. The federal government authorized some staff members, Lafayette said, to make sure the mules were equipped with special shoes for travel on pavement and soil as well as the correct food. What about special precautions for the impoverished human beings making the journey? “No, the people had to care for themselves,” Lafayette answered. The campaign did result in a few lesser victories, such as the federal government allocating free surplus food for distribution in hundreds of U.S. counties in need and agreements with government agencies to hire the poor to lead programs for the poor. Abernathy, of course, desired more impactful actions, but he had to settle for the pocket-sized ones. A half-century after the assassination of King, the implementation of the Poor People’s Campaign and the prophetic “Drum Major” speech, a part of King’s legacy was displayed on March 24 in Washington. She was part of a remarkable scene mixing the past and the present before our very eyes. And it was a gun that killed her grandfather, a horrific murder by a white man that triggered race riots and street violence in at least 100 cities nationwide. For Lafayette, Yolanda Renee brought back memories of his last conversation with her grandfather at the Lorraine Motel in Memphis. On that fateful day, 50 years ago.